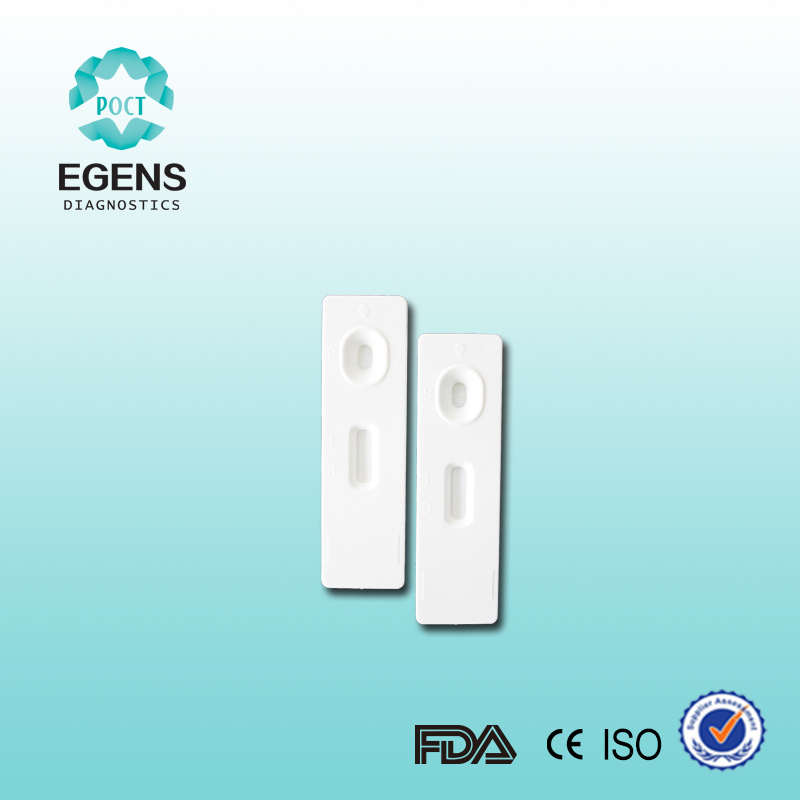 The OnSite Typhoid IgG/IgM Rapid Test is a lateral flow immunoassay for the simultaneous detection and differentiation of anti-Salmonella typhi (S. typhi) IgG and IgM in human serum or plasma. 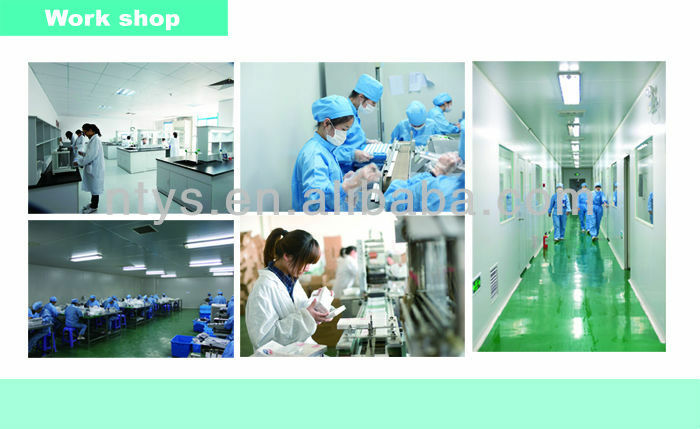 It is intended to be used as a screening test and as an aid in the diagnosis of infection with S. typhi. Any reactive specimen with the OnSite Typhoid IgG/IgM Rapid Test must be confirmed with alternative testing method(s). Typhoid fever is caused by S. typhi, a Gram-negative bacterium. World-wide an estimated 17 millioases and 600,000 associated deaths occur annually1. Patients who are infected with HIV are atgnificantly increased risk of clinical infection with S. typhi2. Evidence of H. pylori infection also presents an increase risk of acquiring typhoid fever. 1-5% of patients become chronic carrier harboring S. typhi in the gallbladder. The clinical diagnosis of typhoid fever depends on the isolation of S. typhi from blood, bone marrow or a specific anatomic lesion. In the facilities that can not afford to perform this complicated and time consuming procedure, Filix-Widal test is used to facilitate the diagnosis. However, many limitations lead to difficulties in the interpretation of the Widal test3,4. In contrast, the OnSite Typhoid IgG/IgM Rapid Test is a simple and rapid laboratory test. The test imultaneously detects and differentiates the IgG and the IgM antibodies to S. typhi specific antigen thus to aid in the determination of current or previous exposure to the S. typhi. 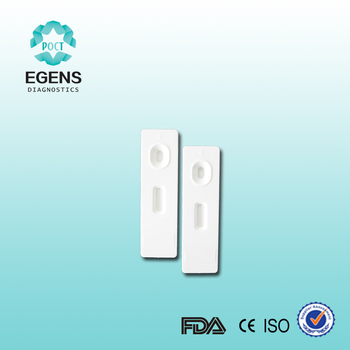 The OnSite Typhoid IgG/IgM Rapid Test is a lateral flow chromatographic immunoassay. The test cassette consists of: 1) a burgundy colored conjugate pad containing recombinant S. typhoid antigen conjugated with colloid gold (Typhoid conjugates) and rabbit IgG-gold conjugates, 2) a nitrocellulose membrane strip containing two test bands (T1 and T2 bands) and a control band (C band). The T1 band is pre-coated with monoclonal anti-human IgM for the detection of anti-S. typhi IgM, T2 band is pre-coated with reagents for the detection of anti-S. typhi IgG, and the C band is pre-coated with goat anti rabbit IgG. When an adequate volume of test specimen is dispensed into the sample well of the cassette, the test specimen migrates by capillary action across the test cassette. Anti-S. typhi IgM if present in the patient specimen will bind to the Typhoid conjugates. The immunocomplex is then captured on the membrane by the pre-coated anti-human IgM antibody, forming a burgundy colored T1 band, indicating a S. typhi IgM positive test result. immunocomplex is then captured by the pre-coated reagents on the membrane, forming a burgundy colored T2 band, indicating a S. typhi IgG positive test result. Absence of any T bands (T1 and T2) suggests a negative result. The test contains an internal control (C band) which should exhibit a burgundy colored band of the immunocomplex of goat anti rabbit IgG/rabbit IgG-gold conjugate regardless of the color development on any of the T bands. Otherwise, the test result is invalid and the specimen must be retested with another device. 3. One package insert (instruction for use). 1. This package insert must be read completely before performing the test. Failure to follow the insert gives inaccurate test results. 2. Do not open the sealed pouch, unless ready to conduct the assay. 3. Do not use expired devices. 4. Bring all reagents to room temperature (15°C-30°C) before use. 5. Do not use the components in any other type of test kit as a substitute for the components in this kit. 6. Do not use hemolized blood specimen for testing. 7. Wear protective clothing and disposable gloves while handling the kit reagents and clinical specimens. Wash hands thoroughly after performing the test. transmission of HIV, HBV and other blood-borne pathogens. 9. Do not smoke, drink, or eat in areas where specimens or kit reagents are being handled. 10. Dispose of all specimens and materials used to perform the test as biohazardous waste. 11. Handle the Negative and Positive Control in the same manner as patient specimens. 12. The testing results should be read within 15 minutes after a specimen is applied to the sample well or sample pad of the device. Read result after 15 minutes may give erroneous results. 13. Do not perform the test in a room with strong air flow, ie. an electric fan or strong air-conditioning. 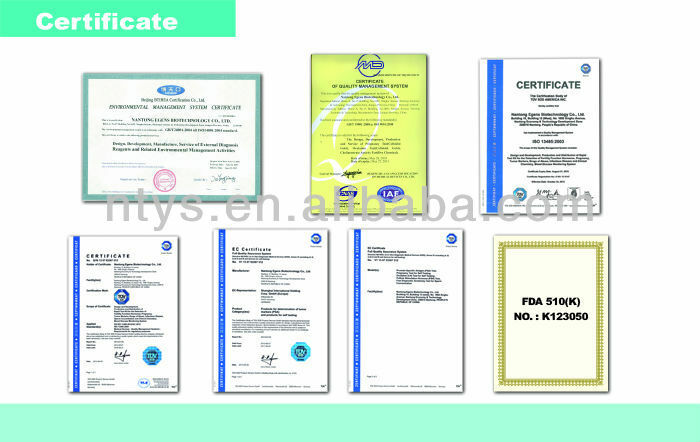 All reagents are ready to use as supplied. Store unused test devices unopened at 2°C-30°C. The positive and negative controls should be kept at 2°C-8°C. If stored at 2°C-8°C, ensure that the test device is brought to room temperature before opening. The test device is stable through the expiration date printed on the sealed pouch. Do not freeze the kit or expose the kit over 30°C. 1.Collect blood specimen into a lavender, blue or green top collection tube (containing EDTA, citrate or heparin, respectively in Vacutainer® ) by veinpuncture. 3. Carefully withdraw the plasma into new pre-labeled tube. 4. Carefully withdraw the serum into a new pre-labeled tube. Test specimens as soon as possible after collecting. Store specimens at 2°C-8°C if not tested immediately. Store specimens at 2°C-8°C up to 5 days. The specimens should be frozen at -20°C for longer storage. Avoid multiple freeze-thaw cycles. Prior to testing, bring frozen specimens to room temperature slowly and mix gently. Specimens containing visible particulate matter should be clarified by centrifugation before testing. Do not use samples demonstrating gross lipemia, gross hemolysis or turbidity in order to avoid interference on result interpretation. Step 1: Bring the specimen and test components to room temperature if refrigerated or frozen. Mix the specimen well prior to assay once thawed. Step 4: Fill the pipette dropper with the specimen. Holding the dropper vertically, dispense 1 drop (about 30-45 µL) of specimen into the Sample well making sure that there are no air bubbles. Then add 1 drop (about 35-50 µL) ofSample Diluent immediately. Step 6: Results can be read in 15 minutes. Positive results can be visible in as short as 1 minute. Don’t read result after 15 minutes. To avoid confusion, discard the test device after interpreting the result. 1. A new operator uses the kit, prior to performing testing of specimens. 2. A new test kit is used. 3. A new shipment of kits is used. 4. The temperature used during storage of the kit falls outside of 2°C -30°C. 5. The temperature of the test area falls outside of 15°C-30°C. Only the C band shows color development, the two T bands (T1 and T2) show no color development. The C band and two T bands (T1 and T2) show color development. The appearance of any burgundy color in the T bands, regardless of intensity, must be considered as presence of the band. INVALID: If no C band is developed, the assay is invalid regardless of any burgundy color in the T bands as indicated below. Repeat the assay with a new device. 1. The Assay Procedure and the Test Result Interpretation must be followed closely when testing the presence of antibodies to S. typhi in serum or plasma from individual subjects. Failure to follow the procedure may give inaccurate results. 2. The OnSite Typhoid IgG/IgM Rapid Test is limited to the qualitative detection of antibodies to S.typhi in human serum or plasma. The intensity of the test band does not have linear correlation with the antibody titer of the specimen. 3. A negative result for an individual subject indicates absence of detectable anti-S. typhi antibodies. However, a negative test result does not preclude the possibility of exposure to S. typhi. 4. A negative result can occur if the quantity of anti-S. typhi antibodies present in the specimen is below the detection limit of the assay, or the antibodies that are detected are not present duringthe stage of disease in which a sample is collected. 5. Some specimens containing unusually high titer of heterophile antibodies or rheumatoid factor may affect expected results. 6. The results obtained with this test should only be interpreted in conjunction with other diagnostic procedures and clinical findings.